Just linking to Lois' most beautiful post about Gerald's art class. Sometimes we get additions to our community who just dive in with open-hearted enthusiasm... in this case one of the newcomers is celebrating one of the not-so-newcomers -- both the author and the subject being, in their adventurousness and authenticity, bright lights of inspiration on our little island. To those who know how we happily avoid repetitive worksheets, scheduled music (or anything else) practice, and most teaching of routinized nature in general, it may seem strange to couple routinized learning with unschooling. But it's not. Routine is natural. We need routine to feel secure, and to develop skills that require repetition. We need repetition to learn. The times repetition can become detrimental to learning is when it is enforced without inspiration or a personal drive to do it. Then it can turn a perfectly interesting lesson into something very boring. 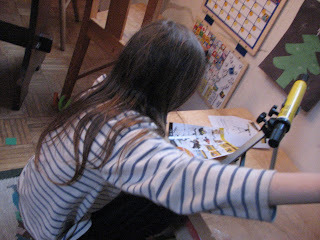 When repetition is a part of the process of discovery, it's fun, and this is where it becomes part of unschooling. I am writing this post wholly as a response to my son's piano adventures, at the moment. He doesn't take piano lessons. I've tried to teach him a few things, and he wasn't very receptive, so I just let it go. Right now he is playing scales. This began with violin. Tal first asked us for a violin, with deep earnestness, when he was two. And so, for his 3rd birthday, he was given one by my mother. He played for a few months like it was his voice. The passion and music that came out of that 1/4-size violin in the hands (and feet) of a boy who really needed a 1/32-size at the time, was amazing. Then my dear mother tried to teach him about his instrument. She began by showing him how to play Twinkle Twinkle, Little Star, which went very well, until she made the mistake of putting tape on the violin, to show him where to put his fingers, and he became so enraged that from that moment on, for years, he would no longer play. None of us had quite realized the seriousness of his aversion to instruction, at that point. Playing guitar-style in Brian's yurt. Finally this year I organized music mentoring for him and his violin (tape-free), with Brian Hoover - a really virtuoso mentor, here on the island. The idea is not to create a performer, but to allow Tal to rediscover the joy that he once had in his instrument. When I arranged the mentoring I was careful to choose someone who I knew could work openly, and could join Taliesin in discovering his violin. Brian pulls up a pillow on the floor with Tal, mimics Tal's bass-clutched-in-feet-style of playing when necessary, waits quietly while Tal imagines, adventures, and processes, and, with his gentle, accepting nature, has led my headstrong but wary son through story-adventures, rhythm exercises and musical instruction, while merging these activities seamlessly in a beautiful journey, every week. Brian leads the way into exploration and discovery as he allows Taliesin to connect with his instrument and learn of his own desire. He has nurtured the seeds of joy in what Tali now again calls "his own" instrument, and now those seeds are growing. Brian knows that Tal resists direction. A couple of months ago they played something that Tal instantly recognized. He looked up suddenly, and almost accusingly. "I know that." Brian calmly said, "Oh. You do?" "It's Twinkle Twinkle, Little Star." Brian handled the situation expertly: "Oh, well I guess it could be. But it doesn't have to be." "Oh." And they progressed onto something else. I had the definite feeling that that had been a very close call, and wondered wordlessly if Brian knew. For a few weeks nothing came of this. Then eventually at one of our Kids' Junkets, he noticed that a friend of ours, only slightly older, who plays violin with the Vancouver Symphony Youth Orchestra, also has tape on his violin. Soon after this, without mentioning anything to anybody, Tal very very slowly picked out the melody to Twinkle Twinkle Little Star on his violin. After some frustration, he came and asked me for some tape. Scotch? "No -- the type I need for... for putting back on my violin." A few days later he proudly played Twinkle Twinkle, Little Star for his beloved Nana, on his taped violin. Eventually he begun picking the song out on the piano, and then, because it was December, he figured out Jingle Bells. Then Silent Night. Then he tried some of the same on our Melodica, then on the recorder, then on his violin. He continued playing the piano and violin expressively, without intent, as well, but his scientific experimenting with the various instruments grew to the point where now, about two months later, he figures out about one new song (though often only the first part) every few days. Some of his favourites are Greensleeves, To Drive the Cold Winter Away, Bingham Bailey (Wild Boar), and the Swan's Theme (Swan Lake). Why scales? Well, because yesterday he was experimenting with different intervals on the piano, and I explained about intervals on the piano, telling also about 3rds and 5ths, since that's mostly what he was doing... And guess what Brian happened to show him, today? How to play two notes at once on the violin! What happenstance! So when we got home after violin, ballet, a good long adventure in the meadow and wetland, some games, and dinner, Tal ended up back at the piano, experimenting with intervals. Nobody said anything about it; nobody really paid him much attention, quite frankly. Not even when I realized he was playing scales, one note higher at a time, up to the very very highest note he could. Why is routinized learning important? Because we need it to cement the things we're learning. Even when the things we learn are of our own device and inspiration, we repeat them again and again, allowing us to settle them into those nooks and crannies of our brains where later, perhaps in unexpected ways, they'll come in handy. This choice to routinize their own learning, within self-directed explorative activities, is just one of the many ways our free-range children have of processing and growing within their world. I sometimes feel worried that my relatively free-range children will stagnate in their learning as they often seem to reach everywhere, but nowhere in particular; as they never have to drill something into their brains because somebody said so. To see Taliesin choosing to implant, methodically, every combination of 1-3-5-4321 into his brain is to see him embrace the math and science of music, which is one of the great passions of his life. Taliesin setting up his telescope. Tal has often been put off by me urging him to practice some equations. So he doesn't do it, and we almost never talk about it. He declares that he loves science but hates math. Today, long after violin mentoring, on our way to the meadow, Tal carried his telescope. He said: "Imagine if you had a hundred lenses inside. Then you could see a hundred times as far!" "Well, actually, if they're all the same, each one magnifies the last by the same amount, right? So if you had one that doubled the size something appeared to be, then if you put another one that also doubled, you'd see something twice as big again. Right?" "Yes. So what if you had three of those same lenses in a row?" "Nope. Think again. The third lens doubles what it sees." "Right. So what about four lenses?" "Mama! I don't know eight times two!" (He counted.) "Sixteen." "Right. That's actually an exponential equation. You show it by putting a little tiny number up to the right of the number it's talking about. So this one with four lenses would be a 2 with a little four up beside it. So two-times-two-times-two-times-two. Can you figure out what the equation would be for the three lenses magnification?" He thought about it. "A two with a three?" "Mama, you know this is math." Pause. "But it's also a kind of science." We continued our walk. I'm not going to get into exactly how this conversation had anything to do with Taliesin's piano scales, a few hours later, but I know it did. I will probably never stop touting the importance of a good preschool -- and my Mum is the reason why. She has demonstrated for more years than I've been alive how to nurture and help children to thrive, not only as a preschool teacher, but also as a daycare provider, music therapist and infant development consultant. She has helped thousands of parents to understand their children and to be deeply involved in their children's lives and futures. This year she will retire, and many people are already expressing deep sorrow that their children and grandchildren won't have the opportunity to attend her classes... but if we keep on listening, we can learn from her wisdom and extensive knowledge, and carry her wonderful gift into the future. Here's the article my mother, Lyn van Lidth de Jeude, wrote for her preschool's newsletter, this month (download the newsletter, here). Preschool children typically sleep 11 to 13 hours in every 24 hour period. After 5 years of age most children have given up napping, but the amount of sleep they require remains the same. The preschool years are a peak period for Night Terrors, Nightmares and Sleep Walking. Sleep is vital to your child’s good health, yet many children resist going to bed. Deep (or delta-wave) sleep: is characterized by a drop in body temperature and physical stillness. Children in deep sleep are usually difficult to arouse. During deep sleep blood supply to the muscles is increased, energy is restored, tissue growth and repair occur and important hormones are released for growth and development. REM (rapid eye movement) sleep: is the period in which we dream. These periods occur three to six times a night and range from five to twenty minutes in length. Children in REM sleep may have irregular breathing and heart rates. They often move around, twitching their arms and legs, smiling, sucking and generally appear restless. Virtually all dreaming occurs during REM sleep. Why do Children Resist Going to Sleep? In Canadian Living magazine, Christine Langlois, suggests one reason may be that when children are alone in the dark they confront their fears. To prevent this confrontation, a child may choose bedtime to pick a battle with a sibling or stall by requesting a glass of water. They may ask you to check the closet for monsters when it’s their inner fears that they really want you to keep in check. A child may mention an important issue that is troubling her at bedtime just because that is when she remembers it. Although bedtime may seem like the right time to sit by your child and discuss her concerns, she is probably too tired to participate in a productive conversation. Be sure to make time with her during the day when she is better able to fully share the experience and discuss what may be troubling her. Routines serve an important purpose in slowing down the pace and allowing the child to mentally prepare for sleep. For a preschool child, limiting the routine to a bath, a story and a good night snuggle is perfect. The whole routine should last no longer than half an hour. Children may have difficulty falling asleep for a number of reasons, but the most common cause is being overtired. You might expect that a child who has missed a nap may sleep like a log, but an exhausted child is more likely to have difficulty falling asleep and, if prone to it, may experience night terrors or walk in his sleep. You can usually anticipate sleep problems at times of change (e.g. Just before a family trip, after the birth of a new sibling or when a parent is ill). Night terrors are a common symptom of too little sleep. They usually occur one to four hours after the child has fallen asleep, when the child partially awakens from a period of deep sleep. She may scream, sit up, grind her teeth, open her eyes and look through you rather than at you. After a few minutes, she’ll lay back down and go back to sleep. Usually you can’t wake the child and, that’s a good thing, as it will only aggravate her further. If you can gently guide your child back under the covers, she’ll go back to sleep and, in the morning, she won’t remember a thing. Nightmares are very different fromnight terrors. They are usually an indication of emotional conflict and occur during REM sleep. A child who is crying and calling out after a bad dream is awake. She will need your full assurance and support because she is genuinely frightened. You can help her best by showing that you are in control and that she is safe. Like night terrors, sleep walking usually occurs during deep sleep, one to four hours after falling asleep. If you try to talk to your child, he usually won’t answer or if he does his speech may be garbled. When children sleep walk they may try to do familiar tasks such as eating, brushing teeth or urinating, but because they are confused, they may not do these things in an appropriate place. The most important thing you can do for a sleepwalking child is to keep him safe. Keep outside doors and windows closed and locked and consider a gate across a stairway. The Canadian Sleep Society recommends attaching a bell to the child’s door to alert you to any nocturnal wandering. Children respond best to regular routines. Keeping your child’s bedtime consistent is the best assurance of a good nights sleep. If your child has difficulty waking up in the morning or is too sleepy to eat breakfast consider moving bedtime earlier in 15 minute increments until you accommodate her needs. The May 2010 issue of National Geographic published a very interesting article by D.T. Max titled The Secrets of Sleep. One shocking statistic stated that only 1 in 5 teenagers get the optimal hours of sleep on school nights. A good night’s sleep results in better grades, better attitude and better overall health. We can support these goals by cultivating good sleep habits in the early years. Today we had 18 children with us, ranging from 3 months to 12 years! We just hung around in the forest, and let the kids play. It was so idyllic. Not much else to say, but WE ARE BLESSED!!! Thank goodness for good people, good spirit, and good earth. branch-clinging -- an essential forest skill! For as long as I can remember, I have wanted to learn Sḵwx̱wú7mesh snichim. Probably since my parents took me to my first pow wow on the Capilano Reserve. I made up "native songs" to sing while I hoped nobody was listening. They probably consisted of a lot of "hey-ah-ho", repeated. Sḵwx̱wú7mesh language and culture is not something we've been privileged enough to learn, in our culture. We just live beside them, feeling our surroundings and growing to know and love the lands in this Salish Sea, without the adequate words to describe them. In the current global economy, languages like French, Mandarin, and Spanish are probably more useful, but although we may be global citizens needing to navigate this shrinking world, we are also citizens of Sḵwx̱wú7mesh territory, harvesters of stink currant and sugar kelp, watchers of the snow-line on the mountain we call Sleeping Bear, and humans with feet rooted in the many unique earth-types we walk upon. We need a language that expresses our home. I would like to find methods and opportunities for us to learn this language that speaks to our hearts. Practically speaking, there is a 12-week language course that I'd LOVE to take with our whole family, but something is holding me back. I feel a bit like I would walking down Main St. in a saree. Beautiful, and totally out of place! I suffer from that same white guilt/shame that most of us seem to, and I'm so afraid of stepping out of line, being too present, etc. Being unwelcome. Once, at a closing ceremony for a family member of our friend, we stood around the fire outside the sweat on the Capilano reserve, and we were asked if we wanted to go into the sweat. I was surprised to be asked, and was cautioned by someone else that although it was his duty to ask me, it was also my duty to decline. OK. No problem. But what will I do without my friends around to give me that advice!? Hence my hesitation. Well... I have enough hesitation that I haven't even called to ask if we're allowed. Maybe it's only for Squamish people. Hm. I guess they can always say no. I hope so. Bonnie Performing in part of her eagle costume! Our Learning Community has a few parents organize workshops, throughout the year, and this January we were blessed with the super dancing stilt-skill-sharing of Bonnie. We actually got two workshops with her, a week apart, which gave the kids (and some parents!) the opportunity to try out the stilts twice, giving the opportunity to experience body-memory, and to build on the balance skills they learned the first week. Yes, I tried the stilts, too! It's really a wonderful feeling to overcome the fear of first standing on them, and find oneself walking around, beginning to find balance! Look at the pride on Ryan's face! I hadn't realized until some of us mothers were getting up on the stilts, how terrifying and also how totally rewarding it is to walk on stilts. I think especially for us adults, who have been at a particular level and on a particular equilibrium for such a very long time, that this was dancing out of our skins a bit. Really good to have some hurdles to leap, and this, being something that's not an expected lifeskill, is a nice way to step out of the norm for a few minutes, and feel good about stretching our boundaries. Markus and I tried to build some shorter, more primary-friendly stilts at home, but, since we didn't actually get any direction, our attempts were a little off the mark. Nothing that can't be adjusted at home with a couple of chunks of wood moved, though. There's actually so much enthusiasm from various kids in the program that they may organize a stilt-making workshop! How exciting! Thank you to Tanya and Bonnie for this excellent and rewarding opportunity! Both Taliesin and Nina (not pictured) managed to walk for a while, hands-free. Pretty wonderful achievements, indeed!